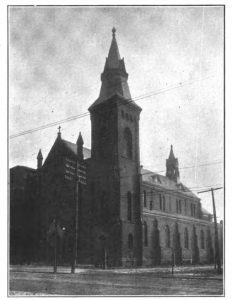 While St. Stanislaus, Corpus Christi, Transfiguration, and St. Adalbert’s Basilica each ministered to the Roman Catholics of Broadway-Fillmore, one parish dominated Buffalo’s Far East Side, St. John Kanty’s. A need for a Polish parish in Buffalo’s Far East Side became apparent at the end of the 1880s. Until then Poles of the area had to walk to St. Stanislaus or St. Adalbert’s to attend Mass. The trek itself was not long but it was dangerous as they would have to cross a number of railroad tracks. As more families moved into the neighborhood, they were reluctant to send their children to the parish schools, fearing for their lives. By November of 1890 it was decided that a parish and school east of the Belt Line would be established for the Poles. On July 19, 1891 the cornerstone was laid for the O’Sullivan-designed brick church with seating for 800. It would take over a year for the building to be completed, including the installation of the windows by Buffalo Stained Glass Works, but in November of 1892 the structure was dedicated. Under the leadership of Father John Flaczek and Father Peter Pitass the parish became be an asset to the rough and tumble neighborhood that surrounded it. But the parish became an outlet for youth activities and a social center for adults and families not, across Polonia under the thirty-one year tenure of Father Andrew Gratska. In 1955 a fire damaged much of the church and destroyed the stained glass in the sanctuary. The church was reconstructed and four new windows and a mural by artist Joseph Mazur were added to the sanctuary. Art would be added to the vestibule when David Smith’s Centennial Mural was unveiled in 1991. In 2007 St. Adalbert’s Basilica was joined to St. John Kanty’s Church and in 2017 Father Michael Burzynski of St. John Gualbert in Cheektowaga became permanent Administrator of the parish.